Modern Gothic interior style and medieval Christmas decorating ideas create a mysterious atmosphere and unusual holiday decor. Artificial black Christmas trees and Christmas decorating in Gothic style were very popular last Christmas season, and some people would decorate a Christmas tree and rooms in Gothic style again. 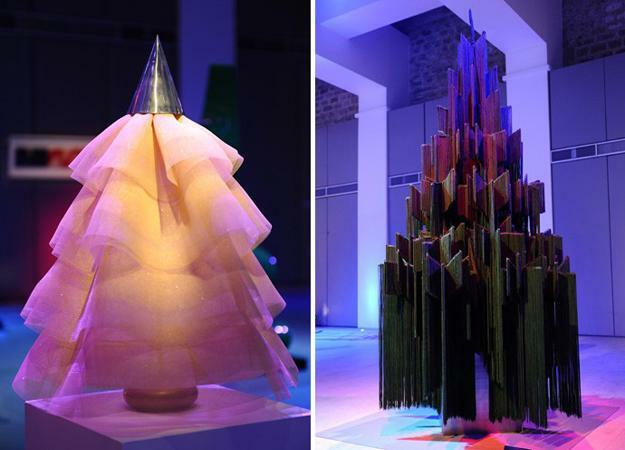 Medieval and neo-Gothic Christmas decor is one of 11 modern Christmas decor trends for winter holiday season. Deep colors, unique Christmas ornaments and old fashioned decor patterns, rich textures and creative Christmas decorating ideas make a striking holiday decor statement in Gothic style. Beautiful examples and inspirations for modern Gothic Christmas decorating ideas can be found in middle ages. Medieval interior design styles and Gothic decorating ideas for celebrating Christmas were influenced by Roman and Gothic architecture. Early Gothic style architecture appeared between 1150 – 1550, then Gothic revival period began in the 19th century. New Gothic style, Victorian Gothic style, differs from the original style by its colorful decorating ideas, bright and luxurious interior design, gold and ornate Christmas decorations of Victorian times. Early Gothic style was born in Northern Europe and existed between 12th and 15th centuries. Gothic style and interior decorating ideas, especially Christmas decoration, were symbolic. Christmas decorating ideas were supposed to demonstrate the triumph of the Catholic church over paganism in Europe. Gothic Christmas decor included festive holiday decorations, which shapes reminded Gothic style church architecture, mainly categorized by pointed arches. Modern Gothic Christmas decorating ideas are inspired by elements of Gothic interior design style and architectural details of old universities, libraries, private residences, castles and churches. Notre Dame Cathedral with its stone tracery and intricate Gothic style architecture is the most famous example of Gothic style. To create Medieval Gothic Christmas decor and the castle like style select soft Christmas lights, deep tones and fine Gothic Christmas decorations, use Gothic clothing and many candles. Rich dark colors are perfect for dramatic decorating ideas: deep red, terracotta, mahogany, copper, violet, eggplant, dark purple, gold, deep green, emerald, royal blue, lapis, navy, silver, charcoal, gray and black. 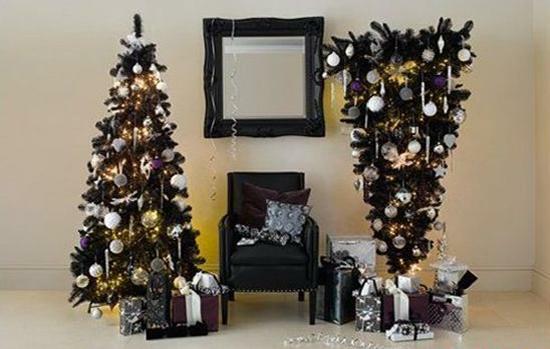 A lot of black color, a few white, champagne, cream or beige decor accessories with golden or silver Christmas decorations create impressive Gothic interior and Christmas tree decoration. Old time wooden Gothic decorations, charming velvet, shiny silk ornaments and stenciled handmade Christmas decorations, classic Gothic Christmas music, glowing lights and a large Gothic style cross will enhance medieval interior design style. A colorful area rug, placed under a Christmas Tree or in front of it, can brighten up dark Gothic Christmas decor. A Christmas tree will look unique and even more captivating, if decorated with dark wood Gothic style cross and religious images. The darker the better. 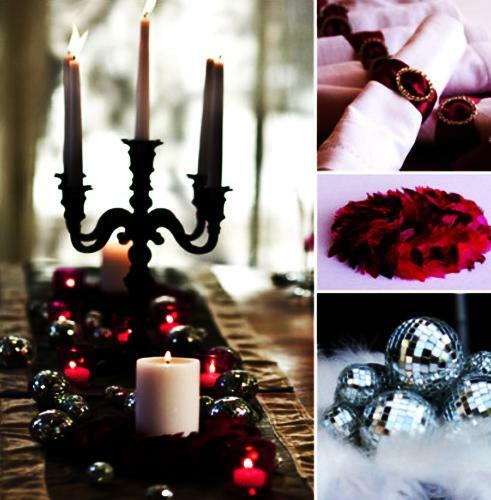 Truly Gothic decorating ideas for Christmas is even darker than medieval style holiday decor. Glowing in the dark soft Christmas lights are a simple way to decorate Christmas tree in Gothic style. Sconces light creates mysterious environment, supporting Gothic decorating ideas and medieval Christmas tradition. Handmade Christmas decorations, dark or black wallpaper on the wall are simple Christmas decorating ideas that help create Gothic interior design style and make the living room look and feel like a medieval dungeon. Purple, black, dark gray or navy blue ornaments and Christmas table decorations with images of dragons, gargoyles, fairies, wizards, angels and ghosts will look excellent beside Christmas tableware and green branches. They make interesting Gothic style centerpieces for Christmas table decoration. Often modern Gothic style is less medieval and more punk. Gothic punk style is inspired by heavy metal rock music and horror movies. Old world dark symbols, ornaments with vampires and wizards, black and dark red images can be used for staging Gothic interiors and decorating a Christmas Tree. Black decorating ideas, glowing brown, black or purple lights and Christmas decorations, plastic, aluminum or wooden skulls and fallen angels will look gorgeous on a Christmas tree decorated in neo Gothic style. Gothic style Christmas stimulate imagination, inspiring adults and kids to learn history. 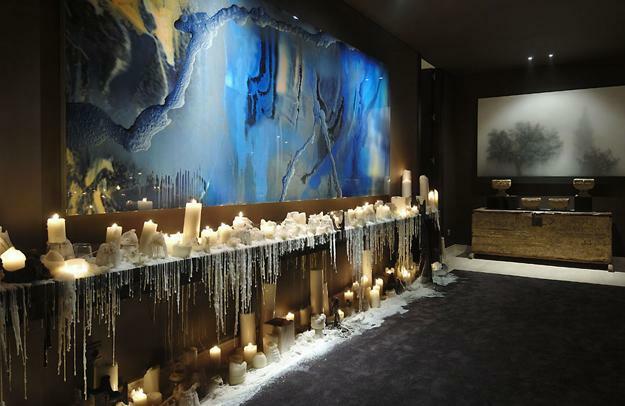 Dark colors work well with modern interior decorating ideas, creating a unique theme for unusual Christmas.